On the Monthly charts – Trend is up and one timeframing for the last 5 trading months. Weekly timeframe trend is up and onetimeframing for last four trading weeks . And on the daily charts Bank nifty futures is in one-timeframing mode for the last 10 trading sessions. so ideally all the timeframes are up and clearly momentum traders in control in the market. Bank Nifty Futures showing tremendous outperformance when compared to the underlying benchmark Nifty Futures. Since Dec 2016 Bank Nifty had done 6000 points it is so far a relentless rally. On Monday Trading Session. Price Opens within the range and Bank Nifty Does a “P” shaped Profile . Value formed higher and Point of control formed higher. Failed to hold below Friday Rally High 22710, Clears the Fridays Poor Structure. Short covering came and now the bottom of the balance holds as the crucial reference 22752 on the downside. 6)Failed Auction 22202 – T+5 Days done and we are in T+6th Day. 1)Price opens within the range and trades above the previous balance. 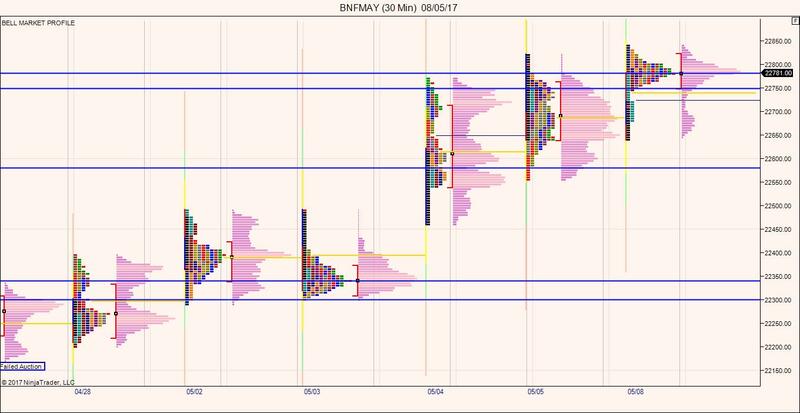 one can anticipate a balanced market with value area overlapping. 2)Price opens gaps up and fails to hold above All time high. In that case price acceptance below 22747 is crucial. Price acceptance below 22747 indicates change in sentiment of the market direction. 3)Price opens gap up and accelerates. Momentum traders are still in control and can move the market to the new territory.